• Starting Point at 10:00 a.m.
• Arrival at 11:00 a.m. Football field - “Centro Sportivo”. At the finish, music and games with the Jolly Animation Staff. Prizes: two bicycles and many other surprises. The ride will last about 40 minutes. (suggestions for the prizes to the Albarella Entertainment Staff). The Island of Albarella at 70km. South of Venice within the Po Delta Nature Reserve is a privately owned tourist centre that represents a quite unique example, on a European level, for the complexity of its systems. Bought by the Marcegaglia Group in 1988, the Island of Albarella is one of the most elegant family tourist resorts on the Adriatic coast. The sumptuous greenery and the large variety of sporting activities, (from golf, to horse riding, to water sports) fulfill the wishes of the most demanding of clients making the Island the perfect choice for relaxtion and pleasure, an ideal family holiday destination. 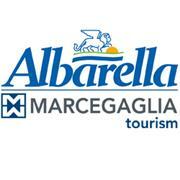 Albarella is a part of the tourist and real estate division of the Marcegaglia Group, who operate under the name of "Marcegaglia Tourism". The nature of the island is unique. There are more than 2 million trees of 150 different species, typical of the flora of the Mediterranean maquis. Albarella has always given shelter to and has been the destination of many different species of animals, it is the natural habitat of Fallow deer, pheasants, hares, Heron, Marsh-Harriers, black winged Stilt and Egrets. The name of the Island is derived from the White Poplar (Populus Alba) tree, "Arborea" in the local dialect. The tourist offer here includes different types of self catering accomodation ranging from villas to apartments for rental or a holiday in one of our Hotels. 1988 was characterized by a major event, a kind of turning point in the history of Albarella: “the lion from Mantova, Mr. Steno Marcegaglia purchased the whole block of shares of Albarella Spa, thus becoming the actual owner of the island which he had started to perceive as his own since 1973, when he first discovered it. As a matter of fact he was among the first guests to discover its beauty and to witness its story thus developing a particular emotional bond to the island. 1989 the preparation phase of an important step forward started: all administrative and executive powers were then passed to the COMMUNITY COUNCIL, the body which was about to self-administer the island. The Community Council was the representative body of the owners and it turned fully operational in 1990. The ultimate organisation of the island occurred under the sign of the family Marcegaglia from Mantova: Mr. Steno Marcegaglia expounded his strategies very clearly and profited a lot from his long lasting experience as the head of a big financial group when applying firmly his well -thought -of administrative criteria. Dott.ssa Emma Marcegaglia, undisputed major example of managerial and entrepreneurial skills, developed innovative and actual programs marked by continuity and renewal at the same time. She particularly devotes great attention to the protection of the environmental heritage of the island, aiming at preserving all the records that ancient and modern history has left behind on the island. Emma is therefore the most evident proof of a story dating back to the time of her childhood, when she visited the island for the first time and literally fell in love with it.